Six Words: 'Black Babies Cost Less To Adopt' In the U.S., more prospective parents seek to adopt white and mixed race children than black children. As a result, many agencies levy lower fees to make it easier for parents to adopt from among the large numbers of black children waiting for placement. 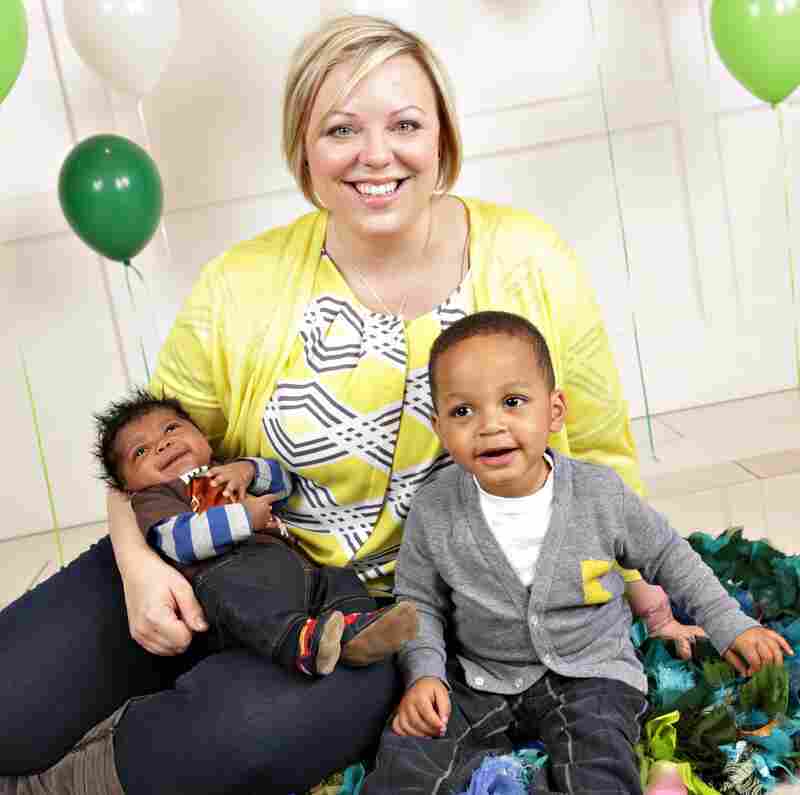 Caryn Lantz and her husband Chuck were surprised to learn that costs associated with adopting black children were much lower than for white or mixed race children. They ultimately went with an adoption in which the fee was based on their income, not skin color. Americans adopt thousands of children each year. And as the nation has become increasingly diverse, and with the growth of international adoption in recent decades, many of those children don't look like their adoptive parents. 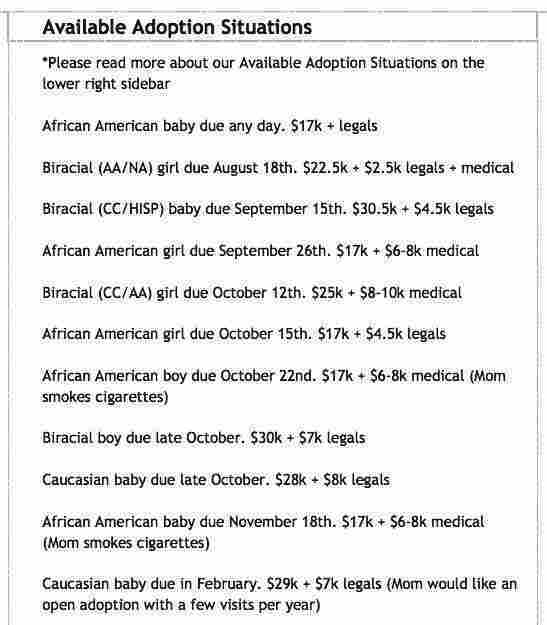 That intersection of race and adoption has prompted many people to submit their six words to The Race Card Project, including this submission from a Louisiana woman: "Black babies cost less to adopt." Other contributors have also addressed the skin-color based fee structure for many adoptions, including Caryn Lantz of Minneapolis. Her six words: "Navigating world as transracial adopted family." Lantz says she remembers a phone call with an adoption agency social worker. "And [she] was telling us about these different fee structures that they had based on the ethnic background of the child. And ... they also had, sort of a different track for adoptive parents." Moving through the process would be quicker if the family was open to adopting an African-American (not biracial) child, the social worker explained to her. "And that is because they have children of color waiting," Lantz says. Adopting biracial, Latino, Asian or Caucasian children could be a slower process, she was told, because there were more parents waiting for them. A screen grab detailing the race-based cost differential for children being placed by various agencies. The original page appeared on the website for an adoption consulting group that links potential parents with adoption agencies. This fee structure has been common for some time throughout the adoption system. The group no longer posts this information to the public and asked to remain anonymous. "And I remember hearing this and just sort of being dumbfounded that they would sort of segregate — to use a loaded term — segregate these children by ethnic background before they were even in this world," Lantz says. "That's when I started realizing that, OK, being a parent to a child of a different ethnic background — this is gonna be some work. There's going to be a lot of work on our end in order to be successful parents and to get our child ready for this world." The Race Card Project spoke with social workers, adoption agencies and adoptive parents about adoption costs based on ethnicity. We discovered that this is not widely talked about, but it is common, Norris tells NPR's David Greene. "No one is comfortable about this." Non-white children, and black children, in particular, are harder to place in adoptive homes, Norris says. So the cost is adjusted to provide an incentive for families that might otherwise be locked out of adoption due to cost, as well as "for families who really have to, maybe have a little bit of prodding to think about adopting across racial lines." In other words, Norris explains, there are often altruistic reasons for the discrepancy — "but people who work in adoption say there's one more reason, quite simply: It's supply and demand." Many people have written to The Race Card Project about the intersection of race and adoption. White Mom, Black Son, barbershop revelations — Kathy Osborne, Greensboro, S.C.
Race adopting outside Race ... least racist. — Tod Carey, Laguna Woods, Calif.
Family matters; race, not at all. — Phyllis Kedl, Little Canada, Minn.
During the process, the family received four calls about potential children to be matched with them — three from states that used this race-based cost structure. "One was a full African-American child, one was a biracial child and one was a white child," Lantz says. "And when they told me the fees for the white child, I was in a Babies R Us [store] and I remember having to sit down in the aisle and say to myself, 'I don't think we can afford to adopt this child if the expectant mother chose us.' "
The cost to adopt the Caucasian child was approximately $35,000, plus some legal expenses. "Versus when we got the first phone call about a little girl, a full African-American girl, it was about $18,000," Lantz says. The cost for adoption of a biracial child was between $24,000 and $26,000. "I am a little nervous about what we're gonna do when he starts to understand why someone approached us at Target and thanked us for saving babies," she explained at the time. "Or when a woman, you know, walks down the aisle of the grocery store and says, 'What's he mixed with?' "
Lantz responded to that incident, she recalls, by saying, "My son, we adopted him at birth. And, you know, his ethnic background is a little different. And we don't know a whole bunch about it, but he is a beautiful kid, isn't he?" Raising, playing, growing and living as a diverse family is an extraordinary experience. It brings both good days and tough days — obstacles and disappointments, laughter and lightheartedness. The journey is full of stares — stares full of curiosity, stares full of love and stares of hatefulness from the people we encounter from time to time in our lives. While both my husband and I want to believe that society has risen above racism — we have a biracial president after all — it still exists and we talk our kids through it and about it all of the time, especially our teenager, who is now driving and looks like an adult — especially to a police officer. I wouldn't change anything about our experience! We learn something new every day and we share our openness, love and acceptance with everyone we know/meet. Life is precious!